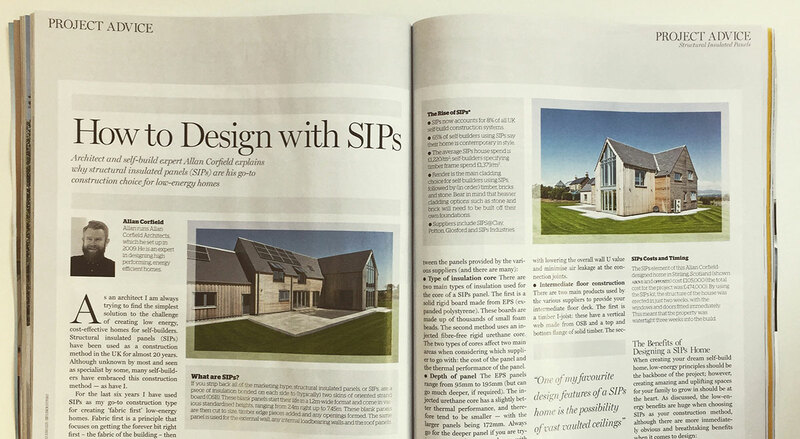 In December’s issue of Homebuilding & Renovating magazine Allan described the advantages and disadvantages of using Structural Insulated Panels (SIPs) for building a low energy home and why you should consider it for your self-build project. In this follow up article, we will present the main features of SIPs and discuss the benefits and limitations. We will also include Allan’s top tips on how to get the most from this construction system and our favourite 5 SIPs projects. 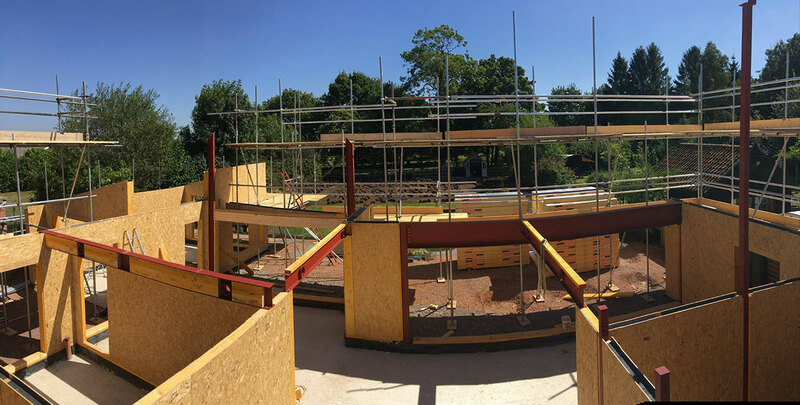 Structural Insulated Panels (SIPs) as a construction method has been used in the UK for almost 20 years and their popularity continues to grow (If you want to read more about SIPS read this article). This is because they offer the perfect solution for building a low energy home based on the principles of the ‘fabric first’ approach (more information about the ‘fabric first’ approach here). When building your dream home, the inclusion of low-energy features should be one of your priorities. SIPs panels offer a solution that means you will not need to compromise to achieve this. Cold bridging refers to elements of structure which connect from the outside of your building to the inside – this is obviously a bad thing! There are 2 areas where this happens, repeated (vertical timber studs in a timber frame and linear (at horizontal junctions around the building). In a timber frame building, the spacing between the vertical timber studs within the walls is 600mm centres. In comparison, in a SIPS wall they are 1,200mm centres, therefore reducing the amount of poorly performing timber by half. This dramatically lowers the repeated cold bridging in the building. As SIPS panels are prepared in a factory, they will be more accurate than timber frames that are cut on-site. This helps to limit gaps in construction. When you add up the inherent airtightness of oriented strand boards (OSB) and a rigid insulation core, the air leakage will be limited, making this construction method the perfect option even for Passive house projects. Another benifit of factory production is part of the construction phase is completed in a safe, dry environment. This reduces the time taken to fabricate and then build: a typical two storey, 200m house could take as little as 12 days to factory fabricate and then 12 days to erect on site. Open plan rooms – many self-builders want large, open plan, flexible spaces. SIPs can accommodate this through floor joists and roof panels. Vaulted ceilings – another stunning design feature that is possible to create using SIPs panels are vaulted ceilings. The roof panels are structural so there is no need for traditional roof trusses, which gives freedom when designing ceilings. Glazed gables – the same features of SIPs that enables vaulted ceilings, also makes designing glazed gables possible. This element looks very luxurious when designed efficiently and is affordable for almost every self-builder. Tight budget – SIPs is one of the most expensive timber frame systems, but without a doubt, it’s one of the best. The price per m2 can be between £250-£500, compared with £150 for a timber frame (with trussed roof). However, the energy efficiency will be nowhere near that of a SIPs house, which can provide long-term savings on low energy bills and reduce the impact on the environment. Tight site – one of the main advantages of SIPs is the speed of erection. However to make this possible, the panels need to be fitted using a crane or tele-handler. External – SIPs panels provide both insulation and structure, removing the need for an external finish to provide increased structural support. This gives you the freedom to choose a cladding system that can be modern and lightweight. However, if you want to add a heavier cladding like an external skin of brick or stone, you may need to build them off their own foundations. Internal – we are often asked, “If I build with SIPs, where do my services go; do they go in the panel?”. The answer is “no” (unless you are building in the United States). They go in a service void created with a timber batten. This service void is wide enough to house your heating and electrical services, with larger pipes (such as MVHR or soil waste) located in internal timber stud walls. 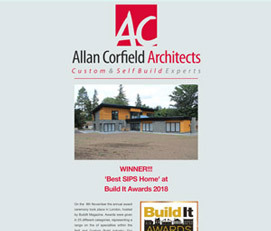 To supplement this article, we decided to choose our top 5 SIPs self-build projects from the past 2 years at Allan Corfield Architects. Hopefully, some of them may inspire your own project somehow. Here are our top 5 projects of low energy SIPs homes we designed. The large dwelling of around 350m2 has five bedrooms – all with en-suite – and a large family bathroom. The main central atrium creates a family dining space – and on the first floor, a lobby seating area where you can look over the double-height atrium, with views across the rolling countryside. Read more about this project in our portfolio here. The layout of the Self Build house sees the entertaining and living areas on the top street level, while the bedroom accommodation is on the lower, river level. This utilises the views along the river and means that the living areas can have large floor to ceiling heights, with exposed vaulted ceilings. Read more about this project in our portfolio here. The large Modernist Self Build house, which would replace a run-down cottage, was designed to maximize the site and views. The 2-storey dwelling house has 5 en-suite bedrooms and open plan living accommodation, linked via a central atrium. 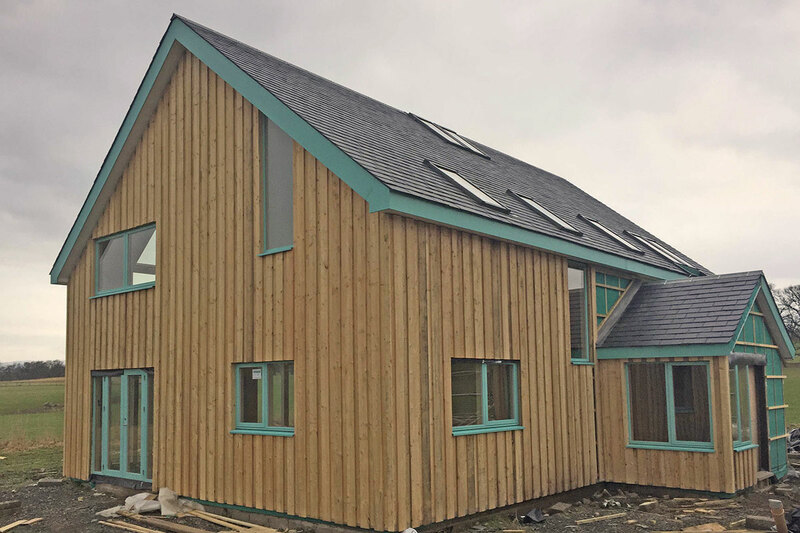 The Self Build house is designed to get as close to Passivhaus energy standards, limiting the ongoing energy demand and future costs. Read more about this project in our portfolio here. 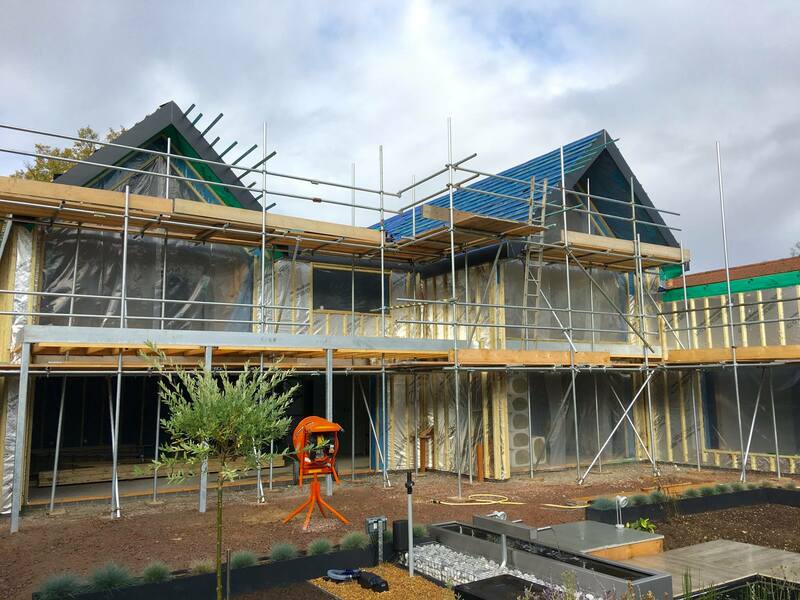 The storey-and-a-half eco home is set around a central room which features a kitchen, dining, and living areas – with a double height mezzanine floor above. The 3 bedrooms are accessed from the central space, giving a great flow to the reduced floor plan. The facades that front the beach all have large full height windows with feature timber louvres. Read more about this project in our portfolio here. The existing single storey dwelling did not meet the owners’ requirements in terms of the accommodation layout. They desired an open plan living space and disliked its outdated appearance. The goal of the project was to create a new three-storey energy efficient home to accommodate a three-generation family. Read more about this project in our portfolio here. Interview multiple SIPs companies – choose the company that balances value for money, quality, and adequate support throughout the project. Choose a company that provides the total package: design, fabrication and site erection. Work with design professionals who are used to working with SIPs and can maximise the benefits and help reduce the costs. Design efficiently, by working with standard panel widths and heights — this will give you the maximum building for your money. A great way to limit all chances of air leakage is to seal the vertical joints (where the outside walls connect to each other) with airtight tape. I would always advise this, as it is a great way to check the workmanship of all of the connections. Before the breathable building paper is fitted to the outside of the kit, ask your architect to ‘snag’ the building prior to releasing the final payment. This way any issues with the fabric can be identified and then corrected. If you have any questions for Allan and the rest of the team, send your suggestions to us via email (marketing@acarchitects.biz), or social media using #asktheselfbuildexperts.